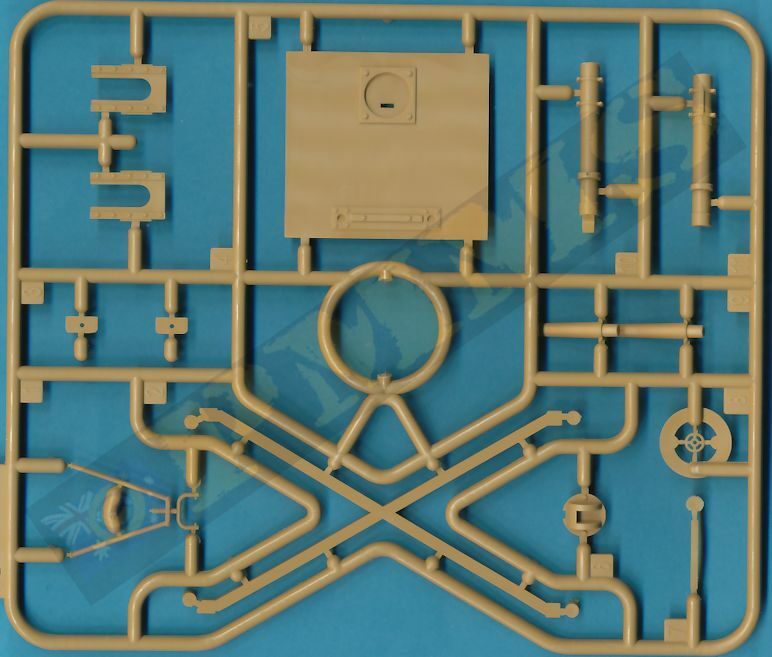 This new kit from Takom follows the previous British Mk.IV Male (Kit #2008) and British Mk.IV Female (kit #2009) and represents the British Mk.IV Tadpole which was a development of the Mk.IV Male with the track horns extended at the back by 9ft for a total length of 13tf 8in. 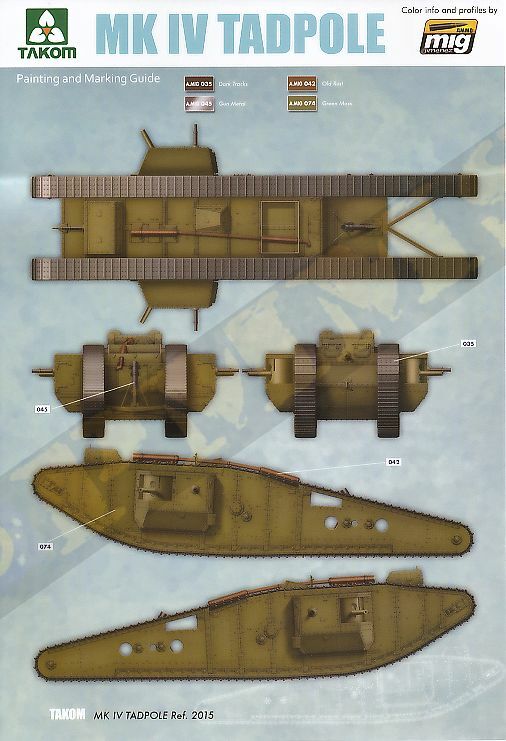 These were designed as an attempt to counter the German practice of widening their trenches at Cambrai to 12ft to make it impossible for the standard Mk.IV to cross the trench. The extended rear horns has bracing added between them but proved to not be very rigid especially when turning the tank and the design was not put into production after testing, some of the test vehicles were also fitted with a 6in mortar fitted between the rear horn extension firing forward and that configuration is the subject of this new kit. 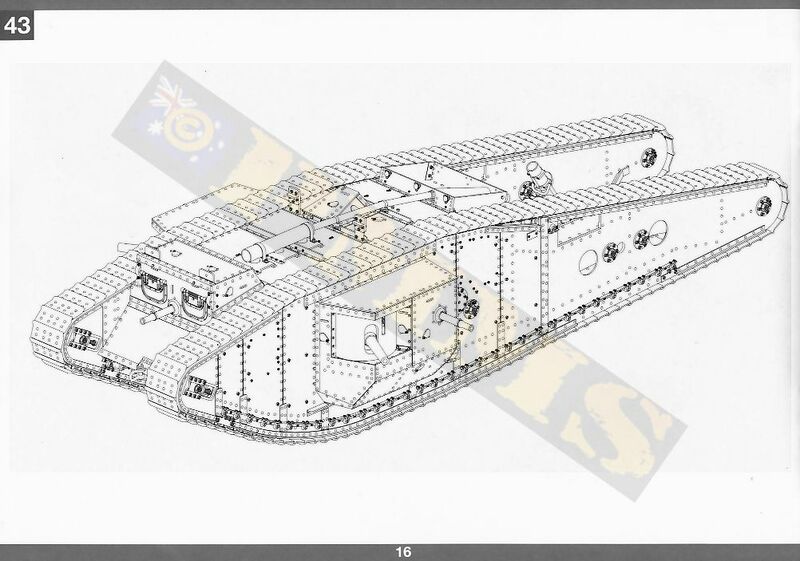 The Tadpole had the same armament as the standard Mk.IV of two Ordnance OF 6pdr gun in each side sponson and three .303in Lewis guns, one in each sponson and one mounted centrally on the front Driver’s compartment plate. The new kit apart from the new larger extended hull panels and the rear mounted mortar is basically the same as the previous British Mk.IV Male and also includes the new click together individual tracks links to replace to multi-part links on the first Mk.IV kits making life a lot easier when it comes to the tracks. 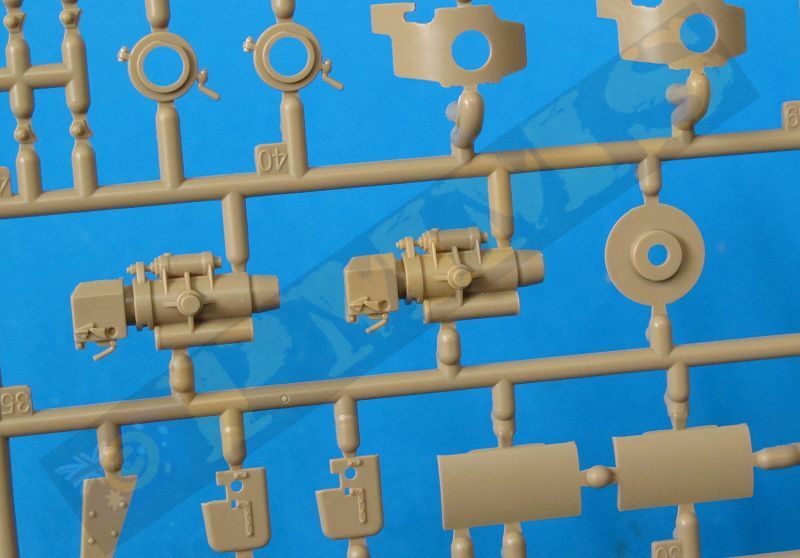 It should be noted that there are no poly caps included with this kit meaning the gun can’t rotate after assembly which does seem to be a bit of an oversight as these are shown in the instructions. 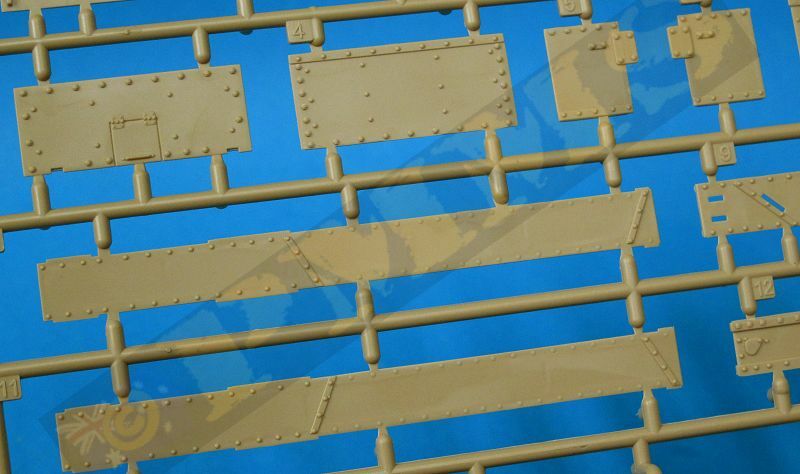 Moulding is clean and crisp with virtually no flash or pin marks, each of the 4 main hull sections are in one single large moulding but unlike the earlier Mk.IV kits there is no internal chain drives provided giving a bit of a hollow look from some angles through the large round hull inspection holes. 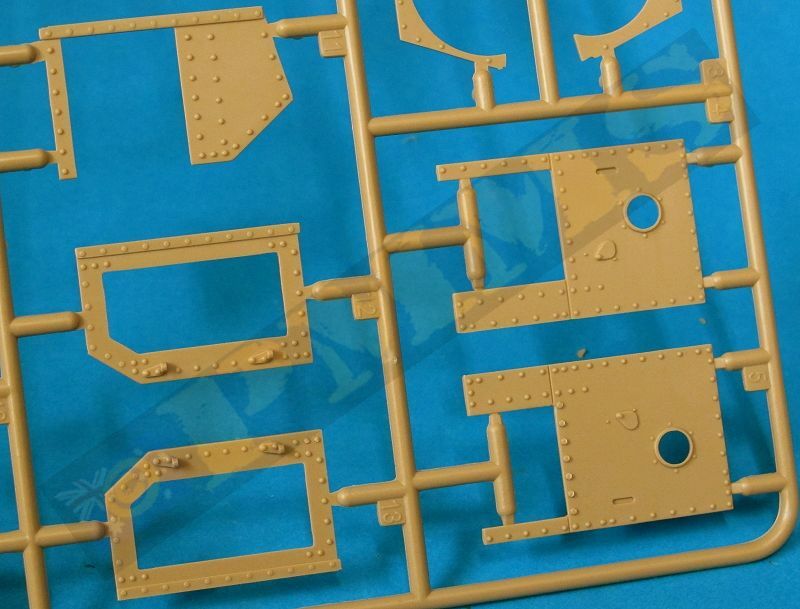 The only real clean-up needed is the many mould seam lines which on some parts is fairly heavy but easily removed with #11 blade or by sanding. 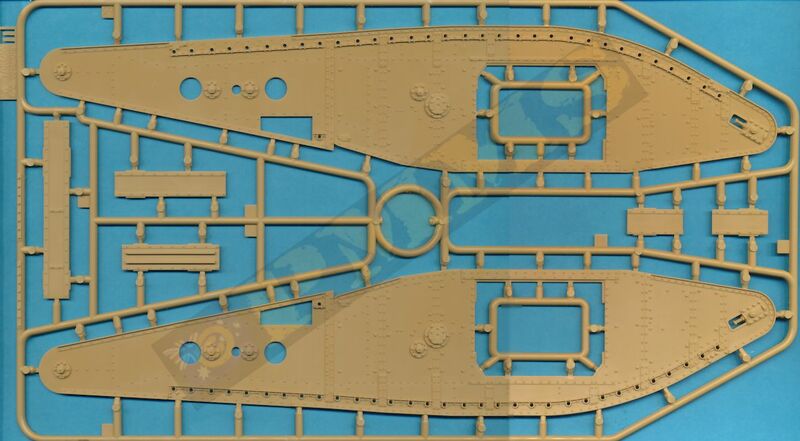 The detail on large outer hull mouldings is included on both sides without any hint of pin marks with the inner hull in six main sections that also have excellent rivet and panel details with bevelled edges and long tabs for precise location of the parts. 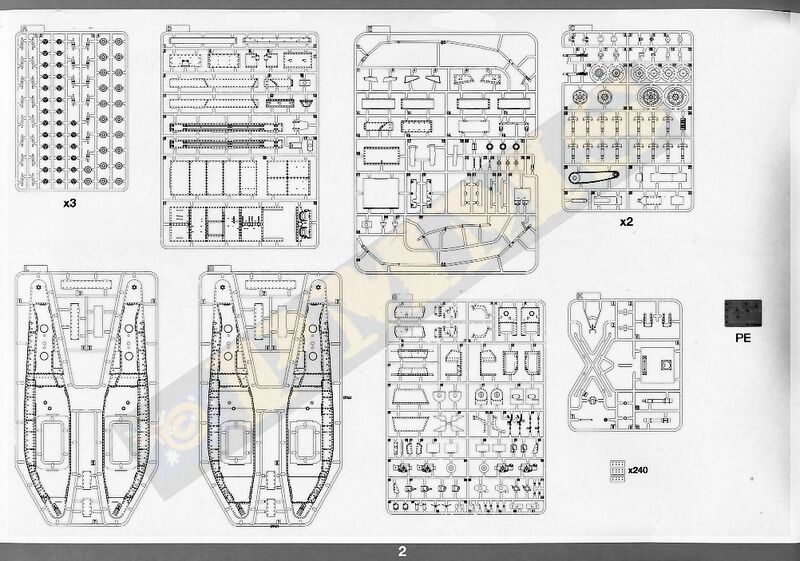 All the pistol ports are moulded in the closed position but the front Commander’s/Driver’s visors and hull top lookout hatch are separate parts that can be shown open if you wish. 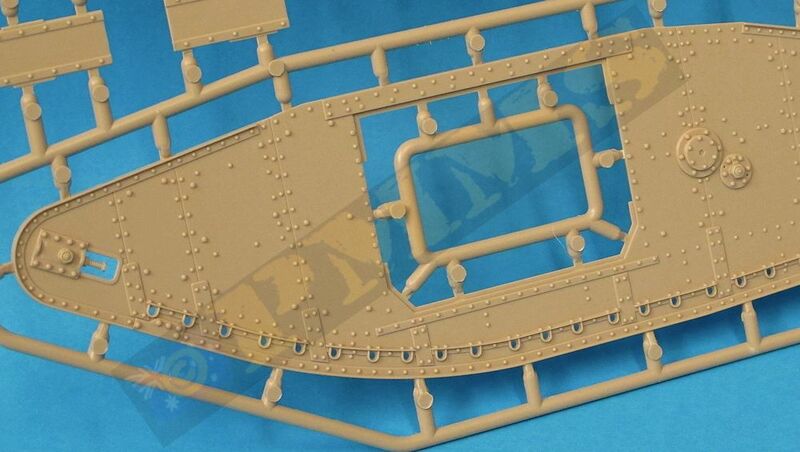 There are a couple of updates for the top hull, firstly the top inspection hatch has been revised to include the cut-out notch and better hinge rivet details although the top of the hatch is still too narrow as is the hull top hatch side plates and the missing pistol port next to the top hatch has now been included. The many hull rivets are quite pronounced as they were on the real thing and perfectly formed to give a good impression from usual viewing distances. The only interior is the full 6pdr gun and breech and mounting as well as the full Lewis guns although this is basically hidden after assembly apart from what can be seen though the rear sponson door if left open? 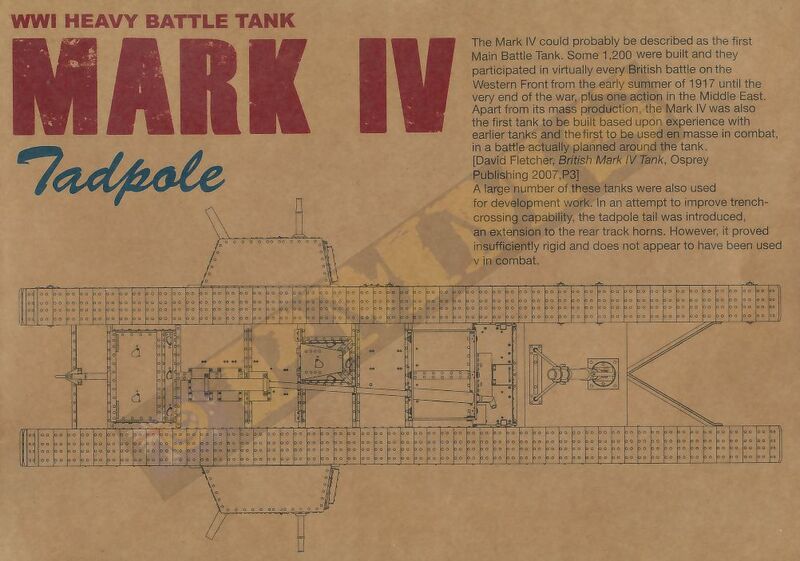 I don’t have any accurate 1:35 plans for the Mk.IV Tadpole but available data suggests the kit is accurate in overall dimensions and has all the features of the Mk.IV nicely represented although as we will see some modelling experience will come in handy as assembly requires care to get best result. 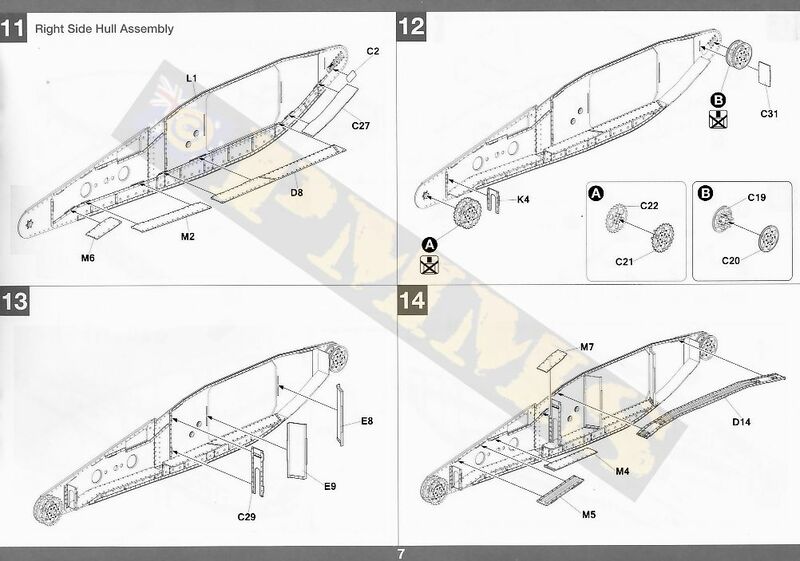 Also note the assembly comments are from the initial Mk.IV kits but as the parts and assembly are the same apart from the new hull parts and some minor part updates these comments should still apply with this kit assembly. Some added comments have also been added for other minor differences between this and the previous kits as required below. 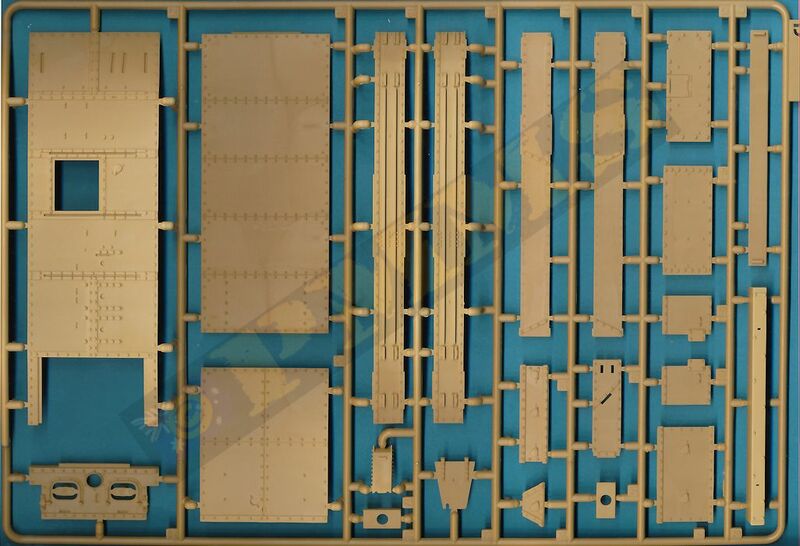 The main central hull is made up of five hull sections plus another five for the Commander’s/Driver’s compartment housing. The detail on the panels is nicely done with bevelled edges and small locating tabs to aid in proper fitting. The Driver’s compartment is assembled first and while the fit of the panels is good overall you need to firmly press these together as the glue “grips” for the best fit as small gaps can appear if not careful. The Lewis gun has the full breech and shoulder stock, handgrip and separate ammo magazine and this is fitted into the Skeens ball socket that includes the sighting aperture, but the gun fit into the ball socket is quite loose and you need to glue the gun into place with thicker tube cement and ensure the barrel sits perfectly central in the ball as the glue dries for the best appearance. Once the glue has dried on the gun/ball join this is held in place on the inside of the front plate with a collar to allow for full movement of the gun/ball after assembly. The front driver’s plate has separate vision flaps but the actual flaps have additional separate smaller vision flaps at the top to allow for forward vision without opening the full flap but this smaller flap is moulded together with the larger piece so can’t be shown open as is often the case. 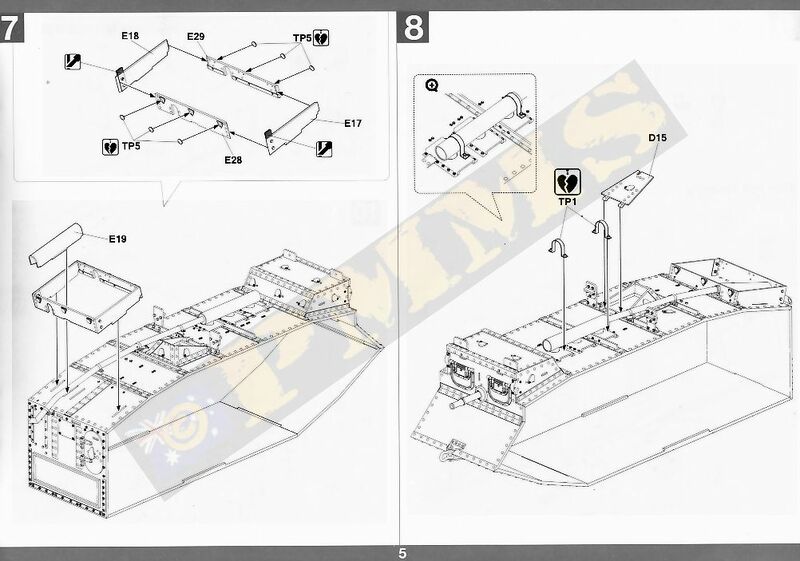 It is best to fully assemble the Commander’s/Driver’s compartment and fit this to the hull top plate before assembling the remainder of the hull panels as opposed to assembling this while joining the other hull panels as shown in the instructions. To ensure the correct angles of the panels I temporarily sat the hull panels into the locating channels on the side rhomboid hull sections (using these as a ‘jig’ for better description) while the glue dried on the main hull taking care not to glue to the side hull at this stage. 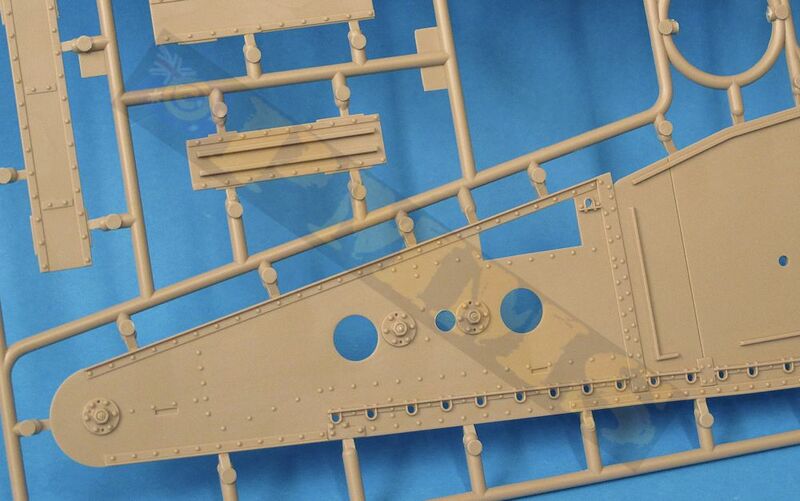 With the main hull sections assembled the smaller details can now be added with the front towing hook assembly fitting without problems, on the top are separate mounting brackets for the exhaust muffler, these give excellent detail definition with the small gaps between the roof and the brackets, there are also etched securing strips for the exhaust muffler to further enhance the detail. Note the two forward mounting brackets are wider than the third and while clear overhead shots are hard to come by I have seen photos showing the three mounting brackets the same width and with the front two wider as depicted on the kit so both configurations are possible although the three the same width appears to be the more common. Some additional details can be added to the muffler if you wish, there is a weld line running along one side of the muffler and four retaining bolts on the end where the pipe exits the muffler, also the etched strip bolts can be enhanced with possible resin or plastic replacements for better definition. There are several cross members added to the roof but these are a little chunky in appearance and could be thinner in profile, the separate rear storage box is made up of four sides and six small etched discs for detail with the fit of the box sides being good as is the fit to the hull roof. Note you must fit the long exhaust pipe before fitting the storage box or the exhaust pipe cover (part E19) but this should be quite obvious really. The rear lookout hatch has three angled sides that fit together okay and fitting these to the roof is straightforward with the hatch sitting on top, but there are few detail issues with this hatch. 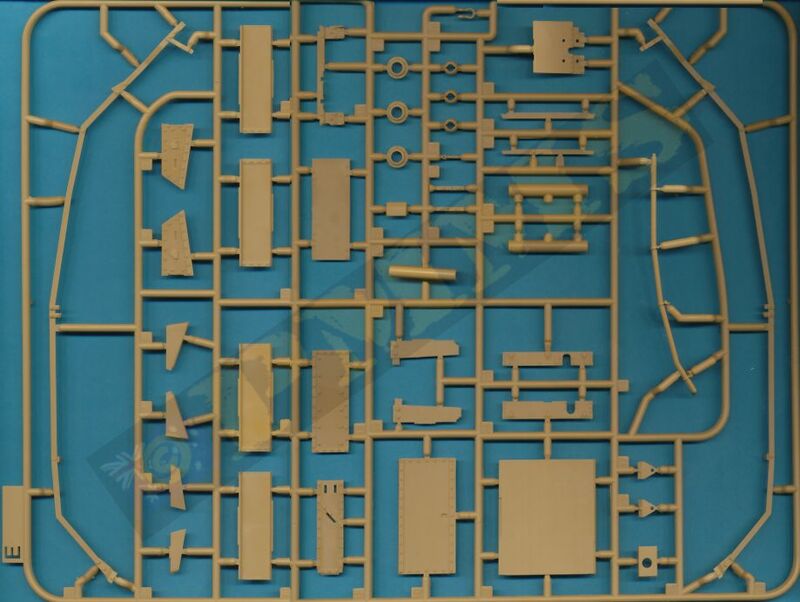 Firstly the hatch (and angled sides) is too narrow at the rear edge, it should be 10mm wide in 1:35 scale (give or take a fraction) but the kit hatch is 8.25mm giving it a narrow appearance while the length of the hatch is okay. 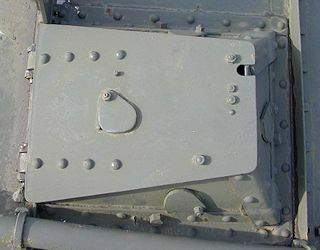 The small notch on the top left corner has been added as mentioned and the four retaining rivets for the hinges have also been included but the three bolts and a rivet at the thinner end of the hatch are not quite right due to the narrow top end not leaving enough space for these to be shown correctly. The top corners of the hatch should also be slightly more rounded which is quite easy to remedy with light sanding. The hatch is an improvement from the initial release kits although the rear width is still as issue and the hatch can be positioned open or closed as you wish but as there is no interior closed would be the best option. Kit top hatch (left) and actual hatch for reference. 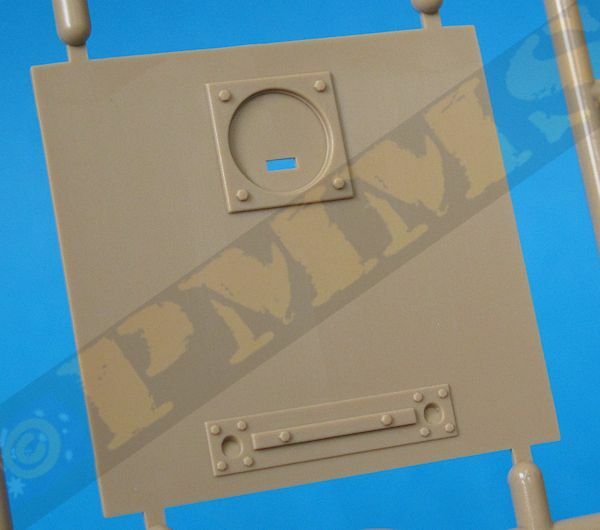 At the rear is the armoured fuel tank made up again of separate panels that fit together without any problems and have excellent surface details included along with two small etched top brackets, note these brackets sit slightly above the top surface attached only to the raised sections on the side plates. 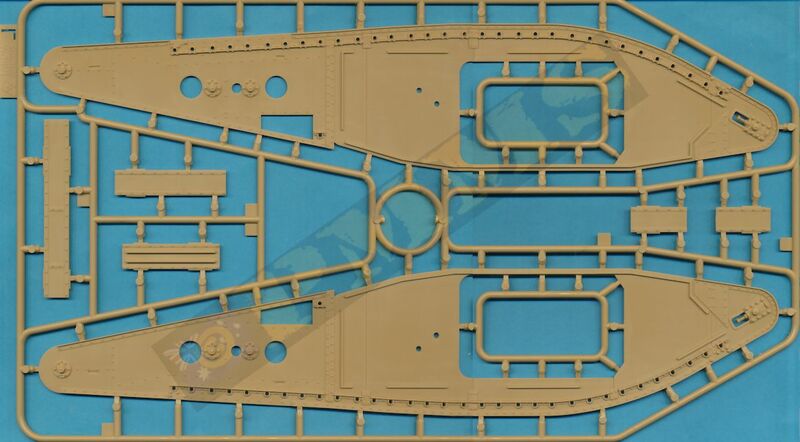 The assembled fuel tank fits precisely to the rear hull that again has nicely done surface details included, the access door is moulded in the closed position but again as there is no interior this shouldn’t be a problem. 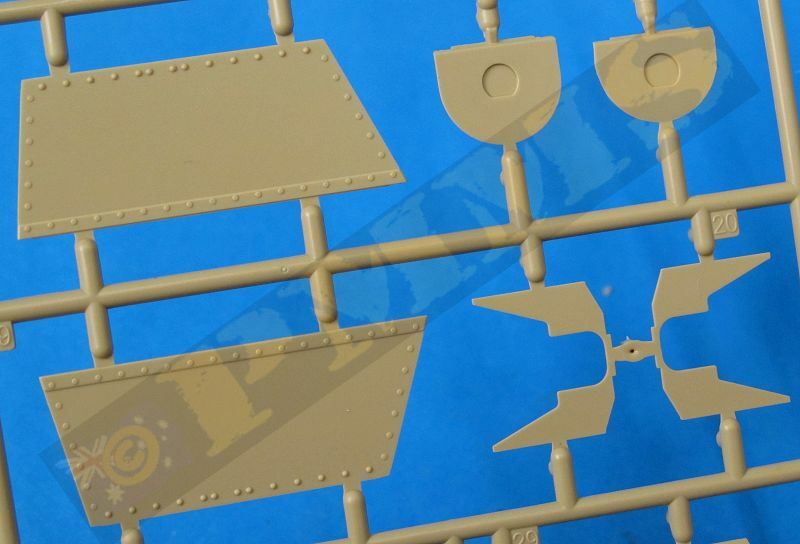 The separate left side air intake louvers have excellent detail with a separate top cover with the correct contours and this adds to the detail definition on the rear hull plate with there being no fit issues with these parts. 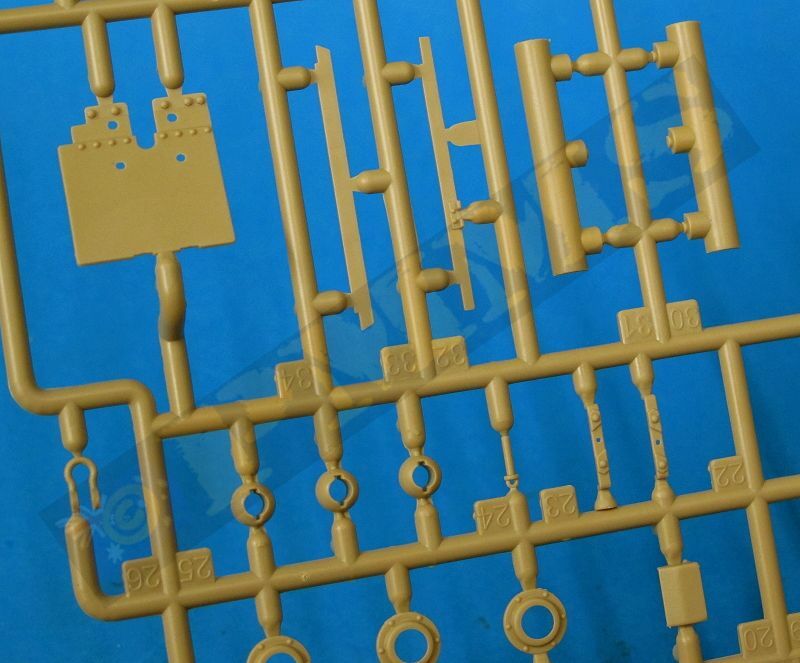 The main updates for the kit are obviously the new hull sections with extended rear track horns and as with the previous kits these are moulded in one large part each with details on both sides (apart from the inside areas hidden after assembly) and are totally free of any pin marks with just the mould seam lines to be removed from around the edges. The rivet detail is well done but some of the bolt head detail not quite so especially those along the top of the road wheels brackets that lack a little in definition. Before tackling the main assemble the small curved backing plates for the idler adjustment mechanism should be fitted (parts C2), it should be noted that the rear mounted towing hooks attached to the final drive bearing covers on the Mk.IVs are not fitted to the Tadpole test vehicles although the parts are still included in the kit. 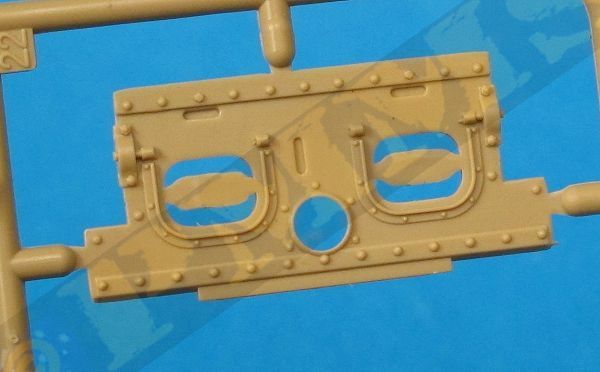 If you wished to build an example of what it might have been if put into production these hooks would most likely have been fitted in the same manner as the standard Mk.IV. 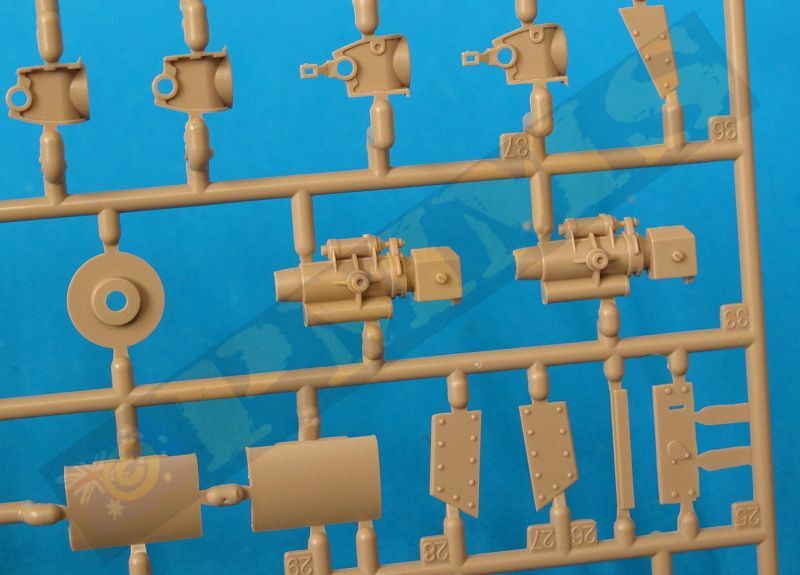 There are no final drive chains for fitting inside the rear hull sections as with the Mk.IV kits (although the shorter Mk.IV chains are still in the kit) and this shouldn’t be a problem as not really visible after assembly but due to the large round inspection holes in the rear extended horns you may get a hollow look from certain viewing angles. 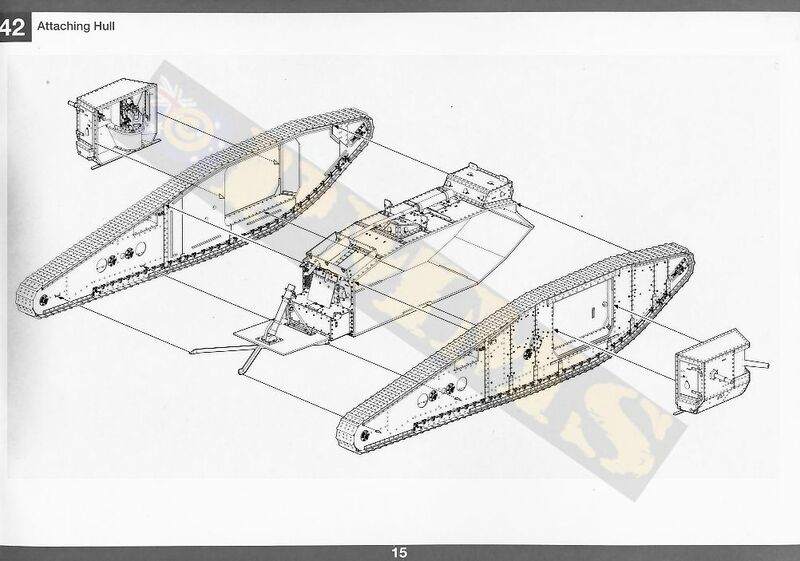 The two large hull sections are joined by a series of inner panels with with additional panels included for the extended hull as well as the top mounted road wheel rollers for guiding the track over the hull to the top channels. 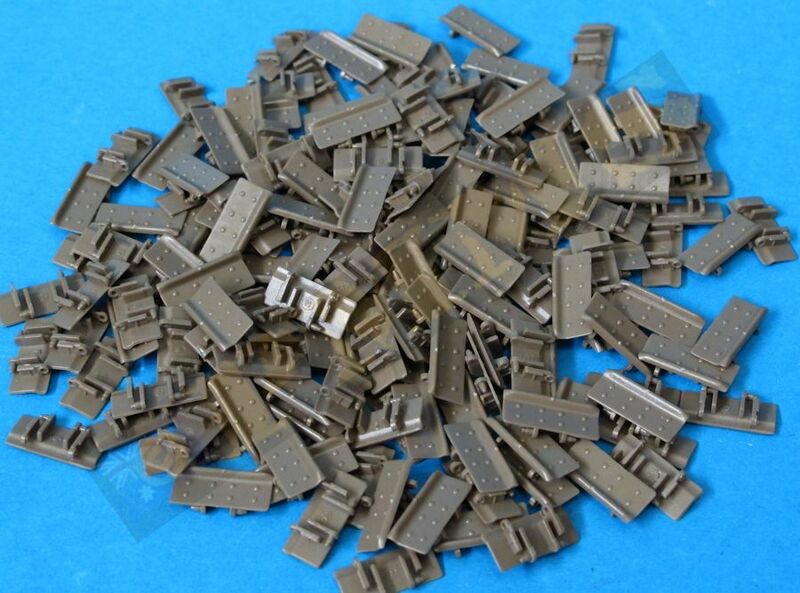 There are two types of road wheel rollers used on the Mk.IV (more on this with the road wheel section below) but the kit gives you the incorrect type for the hull top position as it should be the wheels with the inner flanges but as these can’t be seen after fitting the tracks it’s not really an issue unless modelling the tank without the tracks fitted for whatever reason. When fitting the inner panels it is important to firmly press these into their respective locating recesses as the glue dries to ensure the best fit as there is scope for these not to be seated properly if just sat in place, with the lower front panels you should fit parts (C27) first and then parts C31 to ensure they sit at right angles. 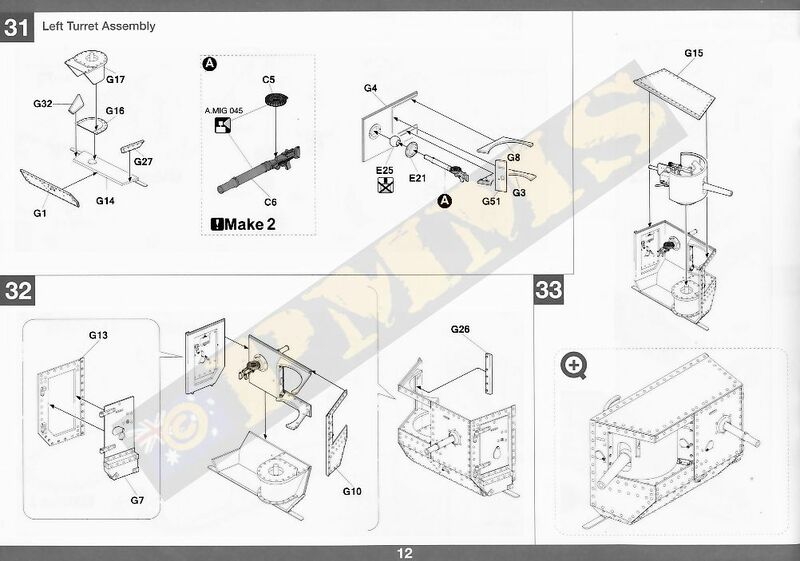 Ensure you note the part numbers and orientation of the inner plates (E8, E9, E10, E11) to fit these in the correct position and as mentioned firmly press into place as you go. The drive sprockets and idlers assemble easily just ensure the drive teeth are aligned correctly as there is a little movement possible when fitting the two sprocket halves together. 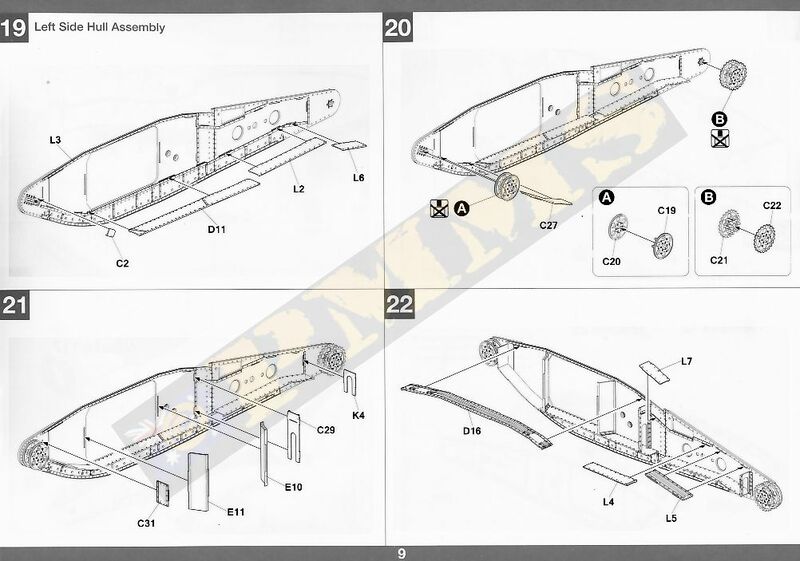 Both the sprockets and idlers are not meant to be glued if you want these to rotate and also there is three alternate positions for the front idler to get the best track tension but as you don’t know what this position is till after you have assembled the hull and track later it’s a bit of a guess to the position of the idler at this point. Before fitting the other hull section you must assemble the road wheel rollers and fit these to the hull so we’ll come back to the final hull assembly after dealing with the road wheels. The road wheels on the Mk.IV are of two types, one type with a pair of flat faced wheels and second type with inner flanges on the wheels to help guide to track over the wheels and there are 32 sets of small road wheels with separate axles per side that will need care removing these from the sprues and during clean-up and it’s best to assemble all the road wheel pairs and let the glue dry before fitting to the hull. Also note there is a small pin on the end of each axle stub and this forms part of the outer stub detail after fitting so take care not to damage or remove these small pins during clean-up and assembly. 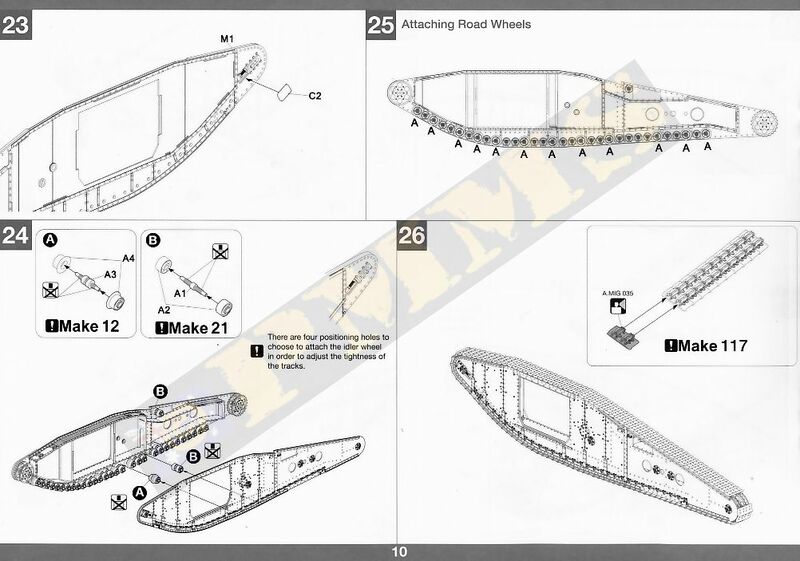 These road wheel types are mixed when fitted onto the lower hull and the instructions have a plan side view drawing that clearly shows to location of the types so follow this as you fit the road wheels. 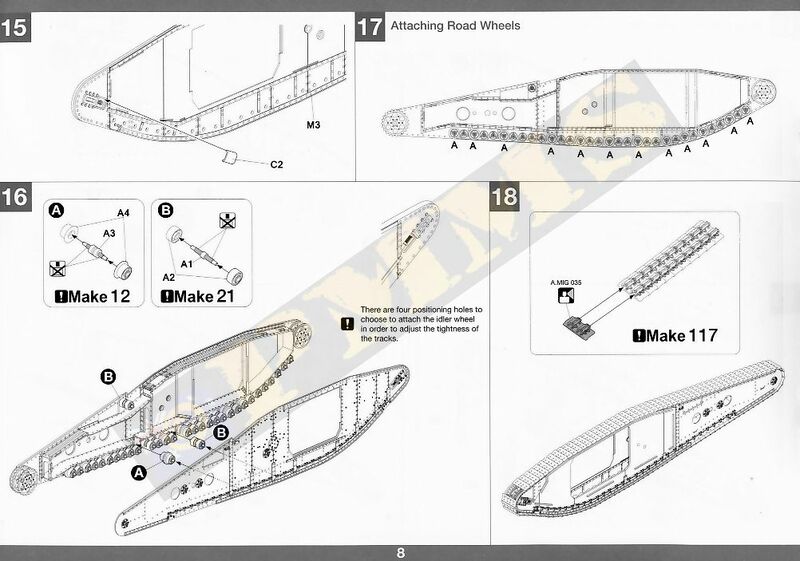 Also the instructions indicate to not glue the road wheels in place but leaving then free to rotate but when fitting the two hull sections together you have to work from one end to align the panels and wheels and those further along just kept popping out of their locating holes and it will save you a lot of hassles to glue the road wheels to one hull side (the same one you have glued the inner joining panels too earlier) before fitting the other hull side. There is no need for the road wheels to rotate after assembly in any case so this shouldn’t cause any problems later. There was an issue when fitting the first and last road wheel groups as these are alternate flat and flanged wheels and there were minor problems getting these together with the axles at 90 degrees and I have to trim a little off the smaller flat road wheels to allow a proper fit but test fitting will determine if this is a problem with you suspension? Fitting the two rhomboid hull sections together needs a little effort and as you fit the outer hull panel the axles subs fit though the appropriate hull side holes and these needed a bit of pressure to seat in place and as mentioned once you have all axle stubs and cross panels fitted you must keep these held firmly together and glue from the rear third of the hull first. As you glue you must firmly press the hull sides together to ensure the inner panels are seated correctly keeping this pressure applied until the glue has ‘gripped’ to ensure the best fit. With the rear section glued you can then glue the middle section again keeping them firmly pressed together for best fit and finally the forward section is glued in the same manner. This assembly is then repeated on the other rhomboid hull assembly and these are left for the glue to dry completely before fitting the main hull assembly. I have used Tamiya Extra Fine Cement as this ‘goes off’ and ‘grips’ quite quickly but any good quality liquid cement should do the job, but if using cement that takes longer to grip you will need to keep the hull assemble clamped together for longer to get the best fit. Fitting the two rhomboid hull sections to the main hull is fairly straightforward as the fit is good overall but you will again need to keep the assemblies firmly pressed or clamped together until the glue dries to ensure the best fit as there is scope for these to slightly move and leave small gaps if not careful. Note the fit here is helped by using the locating channels on the inside of the rhomboid hull sections as a jig when gluing the main hull panels together as mentioned about because if there is any miss-alignment of the main hull panels this will make the final assembly more complex. Added between the extended rear hull track horns is the X cross bracing (part K2) to which is added the mortar mounting plate and mortar with the tube in two halves and the joins will have to be completely eliminated before final assembly. The mountings are fairly simple as they were on the real thing and there shouldn’t be any assembly issues with the parts. 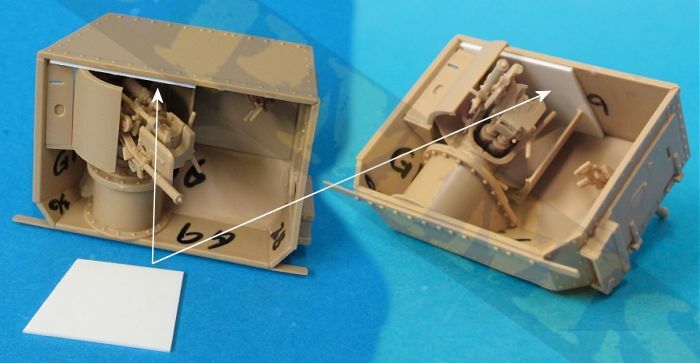 If you wish to build a pilot Tadpole without the mortar you can simple leave out the mortar and base but the X cross bracing would be included on all vehicles. 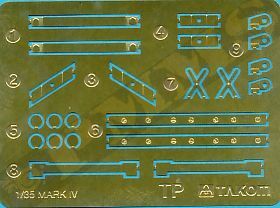 The tracks included with this kit are the new single piece click together track links that have nice rivet details on the face plate as well as the stamped rib detail on the inner brackets for a good appearance. The only clean-up needed is a single pour bur on the top cured section of each face plate and care will be needed to sand or file this flat without compromising the appearance on the link. A few links had some additional flash on the inner bracket but this was only on about 3 or 4 links in the full track run I test assembled so this can easily be cut away if encountered. 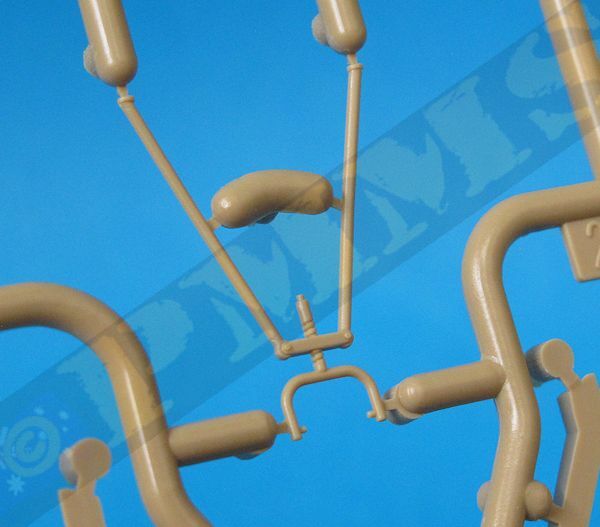 The links simply click together as advertised by slipping the pin on one link into the corresponding hole on the next and applying little outward pressure on the pin to flex out the side bracket slightly the other pin just clips into place without any problems. Assembling the full track run of 117 links takes no time at all after the clean-up of the pour bur as mentioned above. 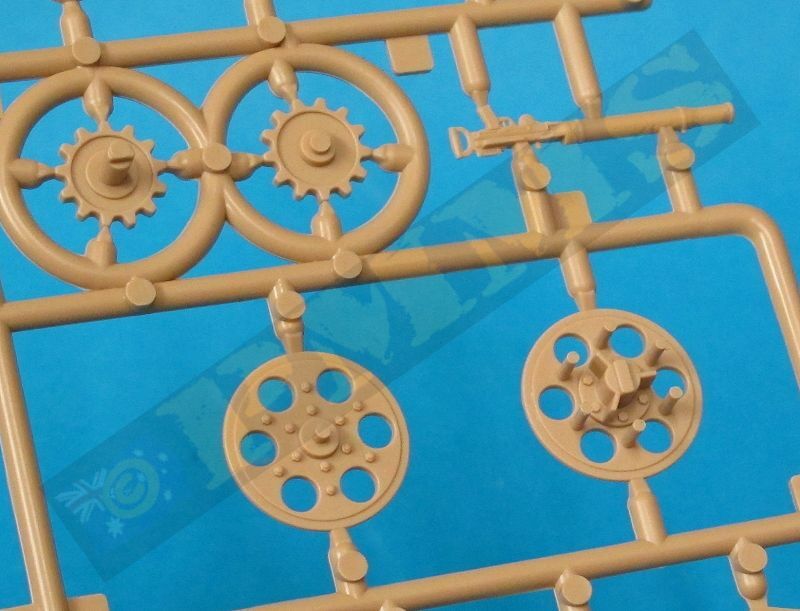 The assembled track runs fit around the kit sprockets perfectly and joining the two ends of the track runs should also be very straightforward using the same method as with the track assembly. 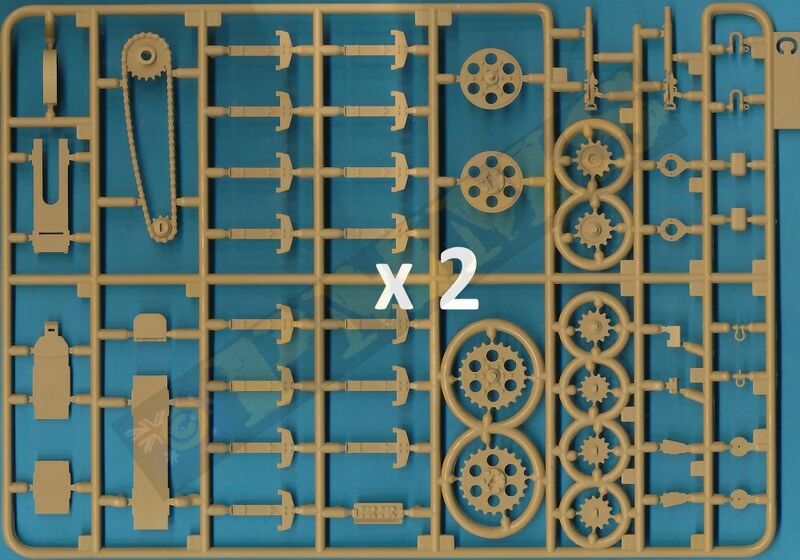 Just a quick note, these tracks will not fit to the Tamiya Mk.IV drive sprockets due to slightly different sprocket width spacing on the two kit sprockets. 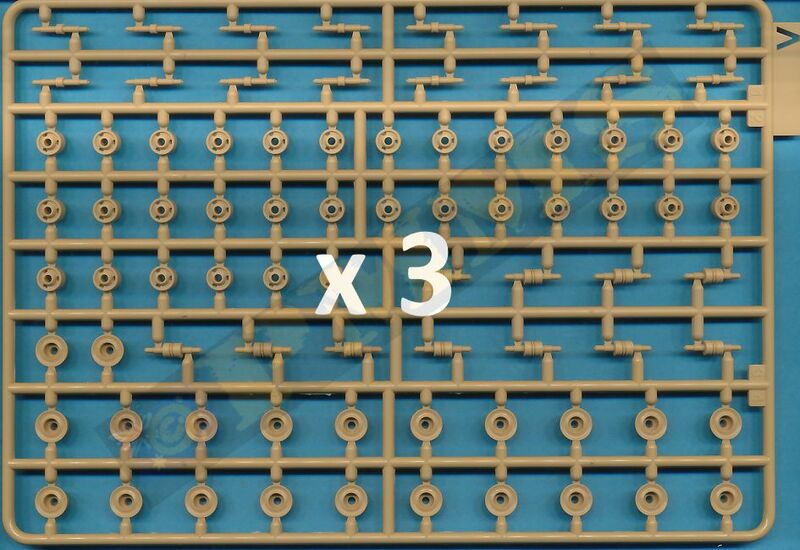 A full build review of the new click together tracks will be posted shortly. The 6pdr gun is nicely detailed with separate breech block, main sight and gunner arm rest, this is moulded extended and you can cut this to show folded if you wish with no fit problems with the gun assembly. 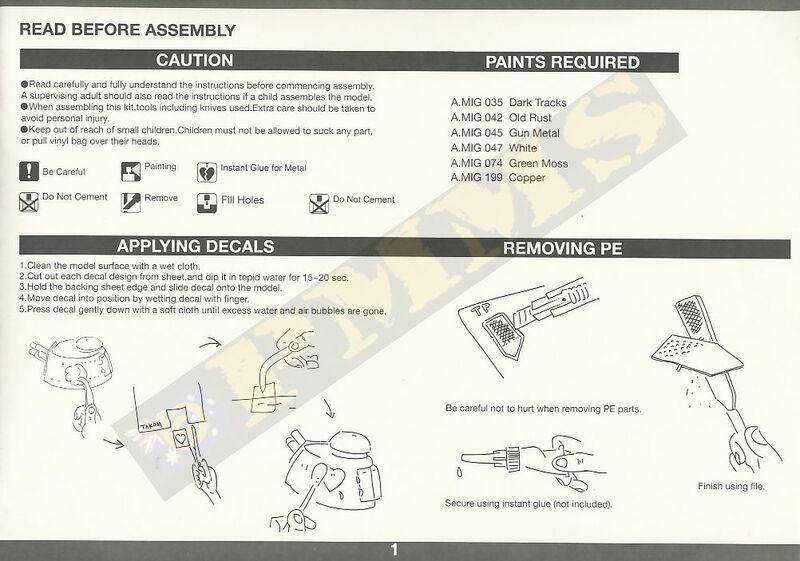 The instructions show the gun held in place on the base by way of a poly cap allowing for traverse but this poly cap is not actually included in the kit so you will need to firmly glue the gun assembly to the mounting in your desired position. 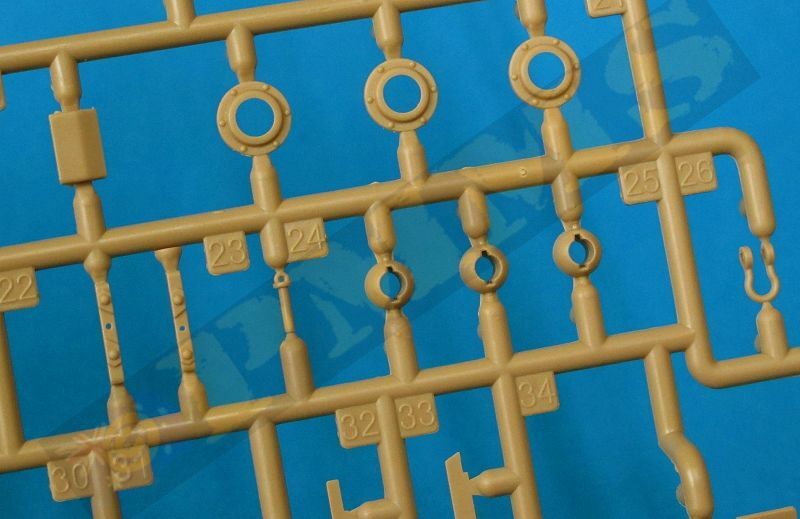 The barrel tubes are plastic in this kit (parts K9) as opposed to metal in the Mk.IV kits and these are moulded as single parts without any mould lines to clean up. 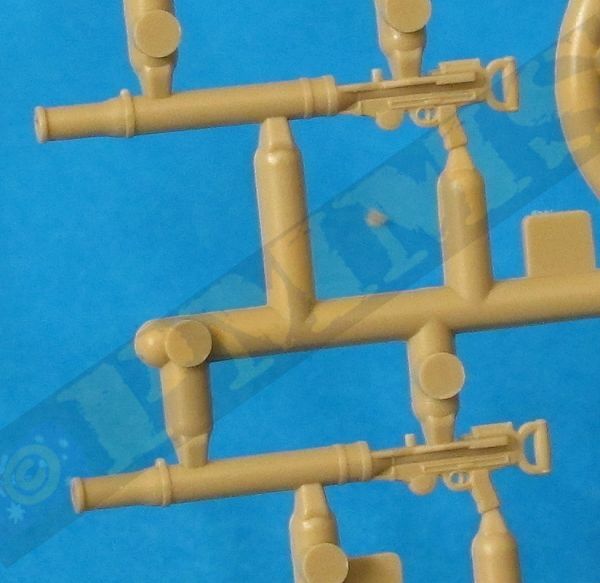 The Lewis guns are also nicely detailed with separate drum magazines and fit into the movable Skeens ball mounting allowing for traverse and elevation. The 6pdr gun shields are in three sections each and joins must be filled and sanded as the actual shields were one piece on the actual tank, the top and bottom edges of the shields must also be sanded lever this being the only real filling needed on the assemblies. 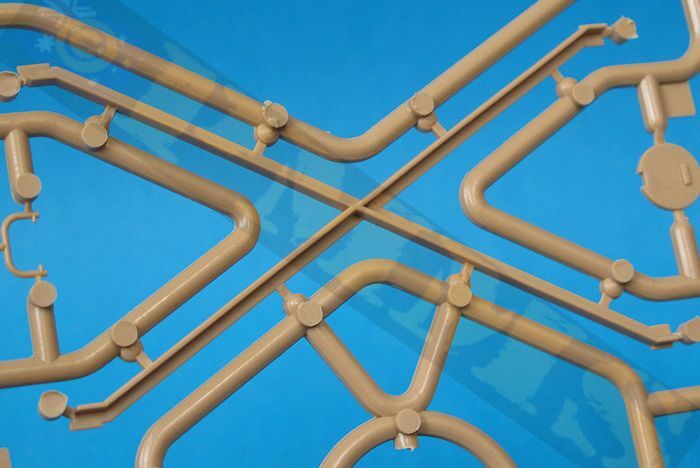 The sponsons are made up of separate panels with a combination of bevelled edges and recesses for fitting the panels together and you must ensure perfect alignment of the panels as you go because a small miss-alignment of one will affect the next and so forth. 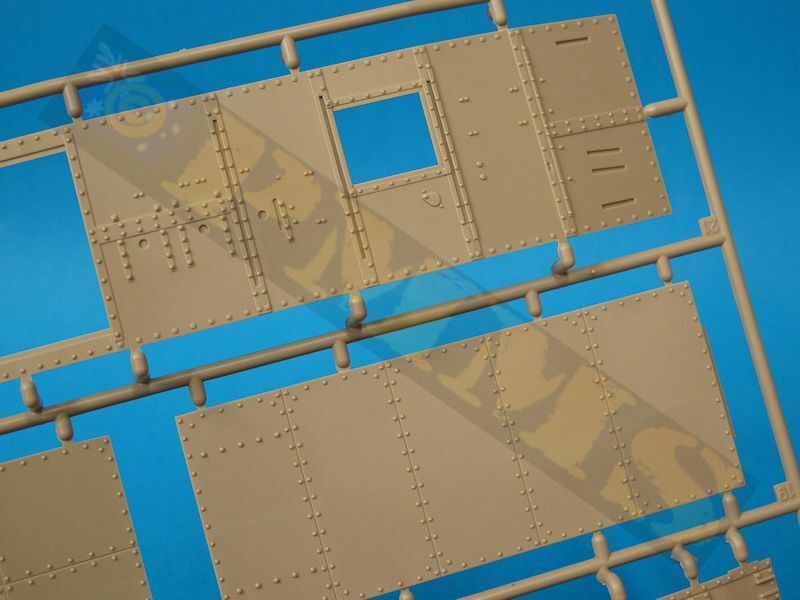 The panel joins are good overall and in some ways too good as the joins between the panels on the actual tanks are quite noticeable with square edges at the join while the kit panels with the bevelled edges form a smooth join. Note the part numbers here refer to the left sponson; check the instructions for the corresponding right sponson numbers. I first assembled the gun mount (parts G16, G17) onto the lower plate (G14) as this gave the correct angle for the lower plate (G1) and then the small side plates (G27, G32). The gun shield flanges (G8, G3) were glued to the inside of the outer plate (G4) and allowed to dry ensuring they set at perfect right angles to the outer plate. Next the front plate (G10) is attached again taking care to align this perfectly with the assembled lower section and the outer plate with flanges can then be fitted ensuring the joins are aligned perfectly as you go. The two small inside plates (G26, G51) are also fitted into place and there were no fit issues here providing you ensure everything is aligned perfectly before gluing as these is scope for gaps if not careful. 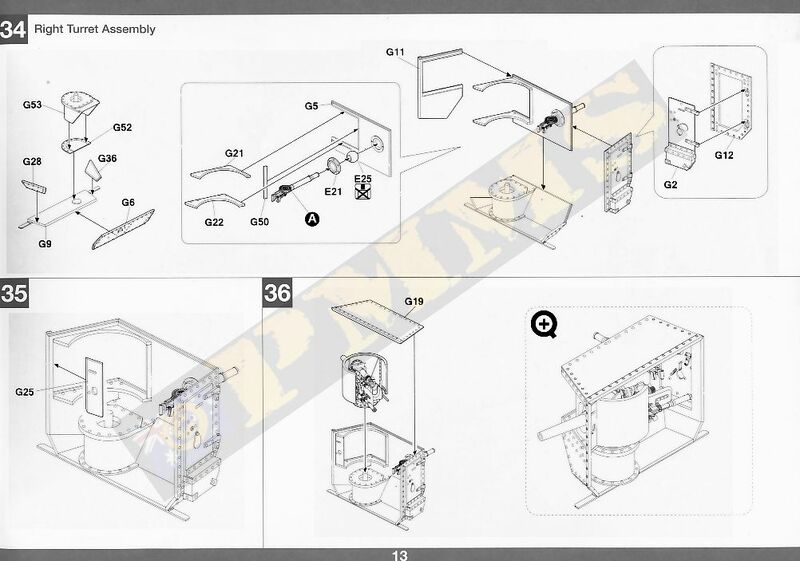 The rear plate (G13) has the entry door (G7) separate and there were no problems fitting this perfectly along the bottom edge and front join to complete the main sponson assembly. 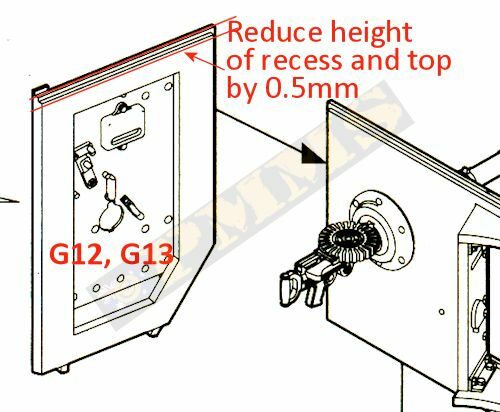 The rear doors can be positioned open or closed as you wish with nice interior detail included on the door as well as the lower shell ejection opening, there are a couple of shallow pin marks inside the ejection recess but these are easy to remove if you are showing the door open? 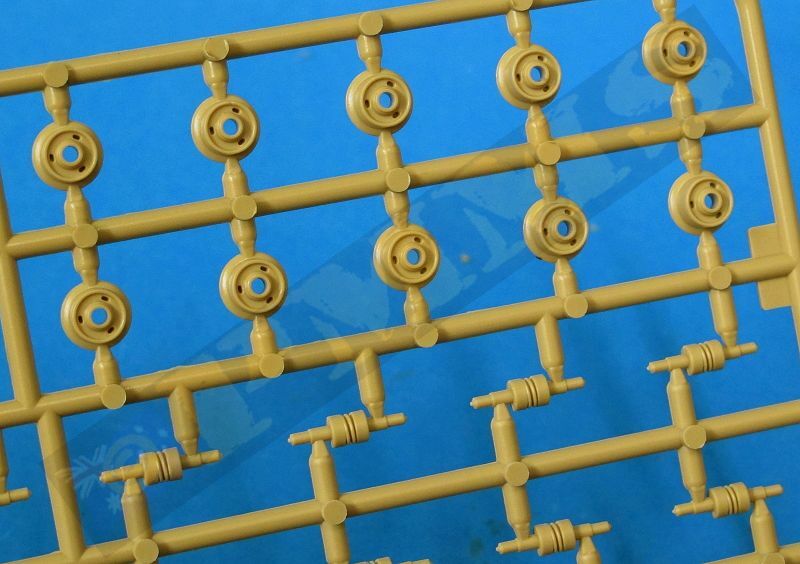 There is another adjustment required before fitting the sponsons to the hull sides if you find and use a poly cap to hold the gun mounting in place, but if you glue the mounting to the base without poly cap the following modification will not be needed. With the sponsons assembled they can now be fitted to the hull sides and apart from ensuring the mating surfaces are smooth there was no other trimming needed for a good fit. 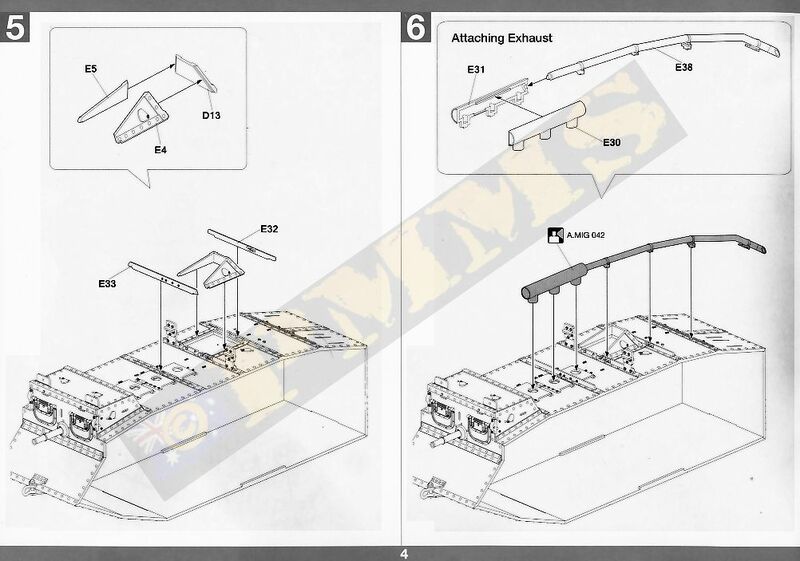 The full hull length ditching rail is moulded in one single piece with just the usual clean-up needed with the instructions showing to fit this to the rhomboid hull sections before assembling the main hull. It is a lot easier to leave the rail off until after the hull is fully assembled to allow easier clamping of the hull sections. Also it has to be attached over the driver’s compartment, mid hull attachment posts and to the rear storage box and you don’t need the additional hassle of fitting this at the same time as fitting the main hull/ rhomboid hull sections together, so leave till later. 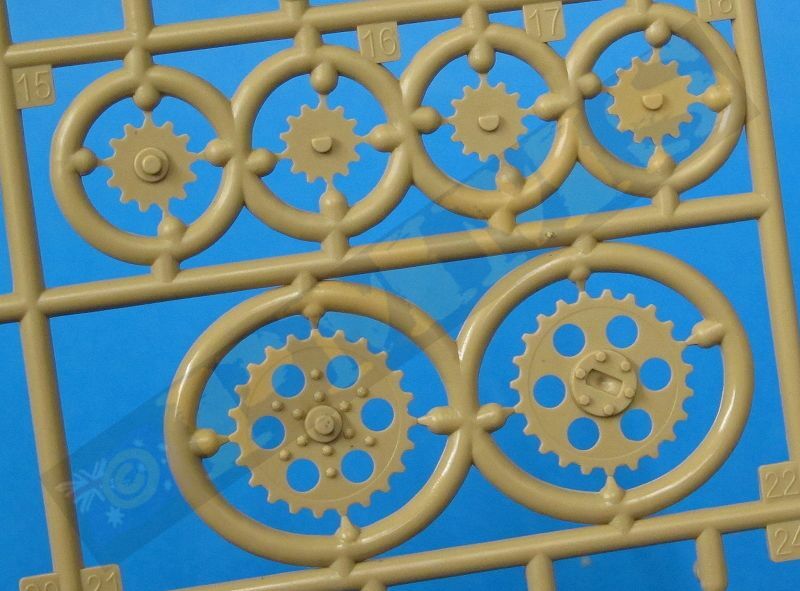 Fitting is easy as each end of the rail attaches to the respective idler and drive sprocket bearing cover and to the top attachment points as mentioned above. 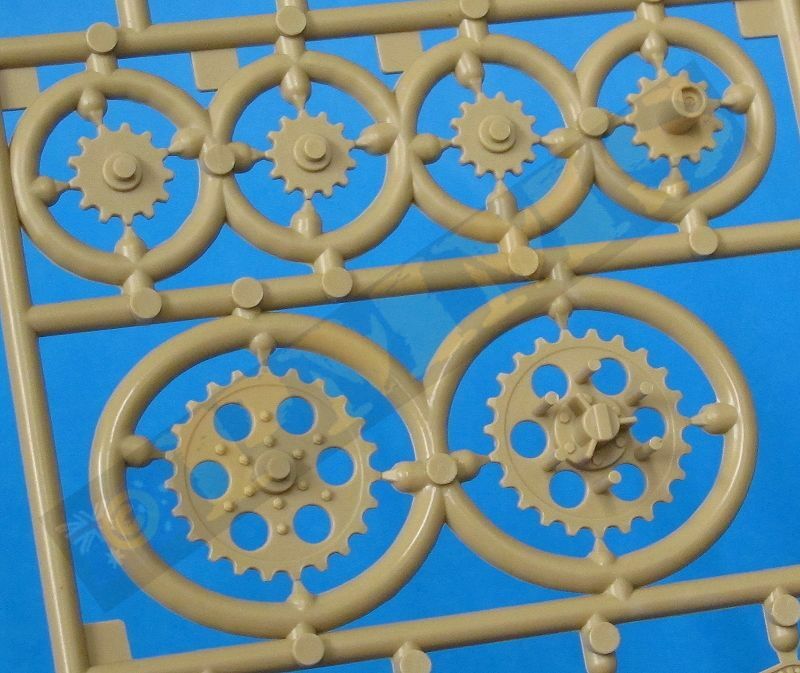 Sometimes there is also a small attachment bar going from the etched brackets (TP2, TP3) to the rails but this isn’t always fitted with numerous period photos without this bracket as depicted in the kit but if you wish to include this additional support it can be made from thin plastic strip. 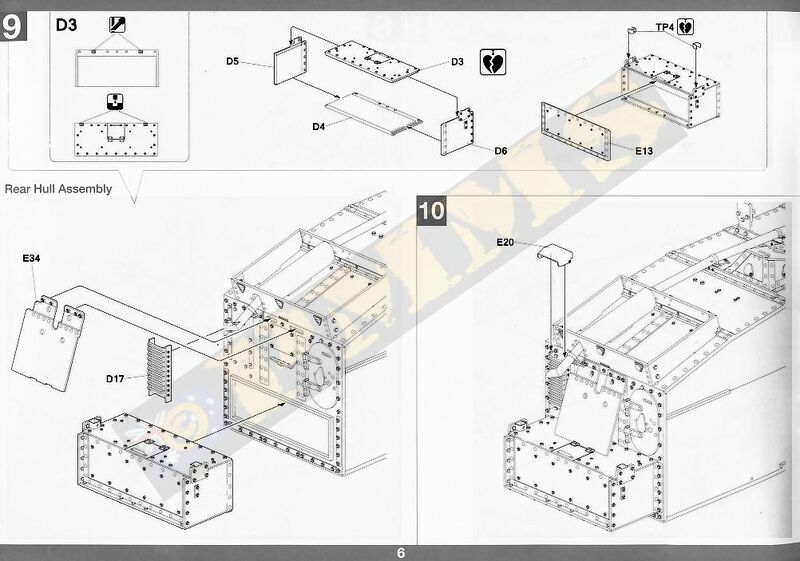 The two part un-ditching beam is included with etched brackets and attachment chain provided and the instructions show this can be fitted in the stowed position on the upper rails with small etched brackets and the chain used to attach to the rail. 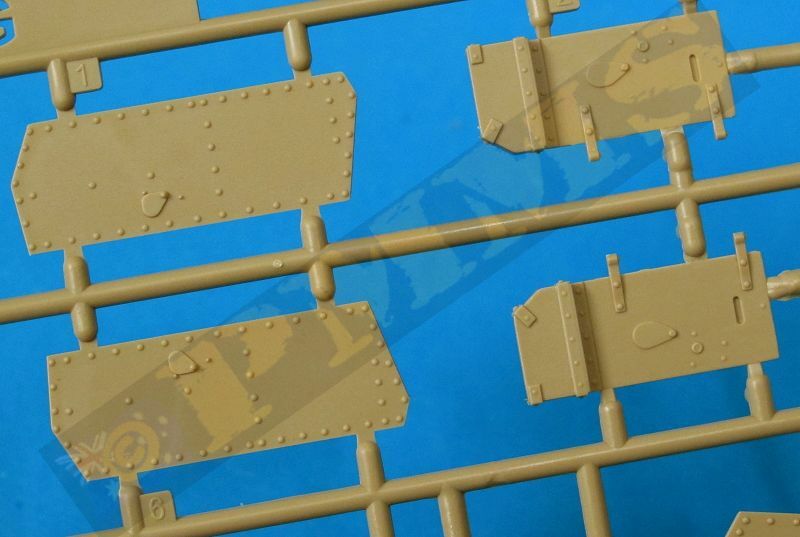 The additional chain is also stowed in the hull top storage box. 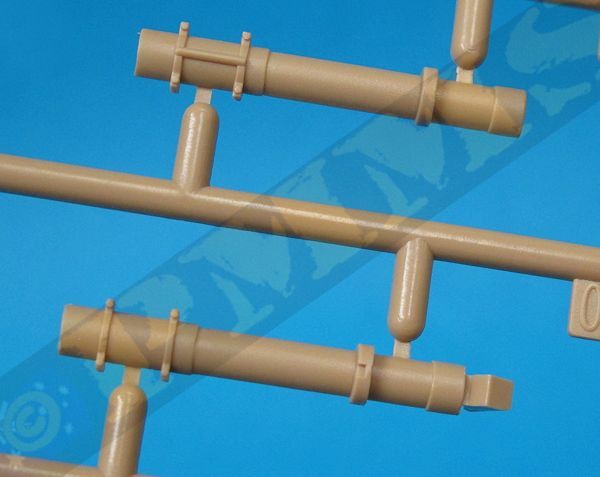 The second option provided is for sitting the beams to the track links when in use with the chain cut into small lengths as indicated in the instructions. 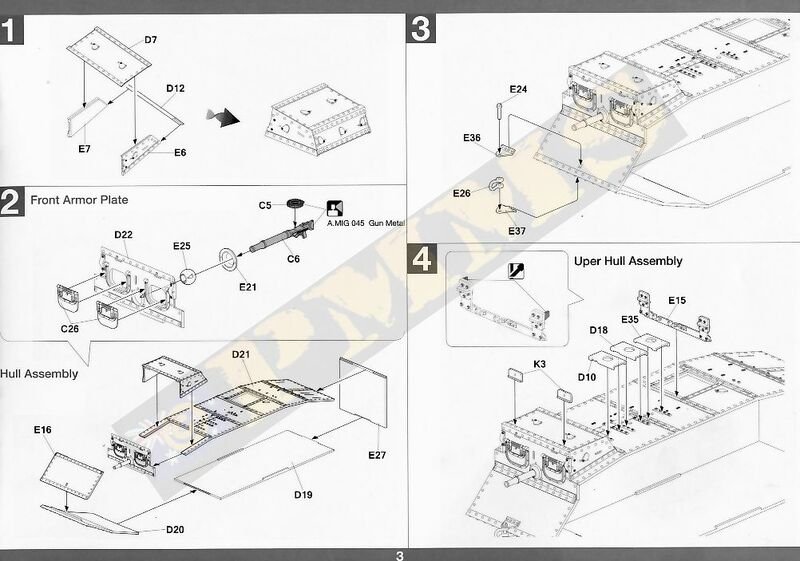 but the clear steps aided in making assembly quite straightforward overall. 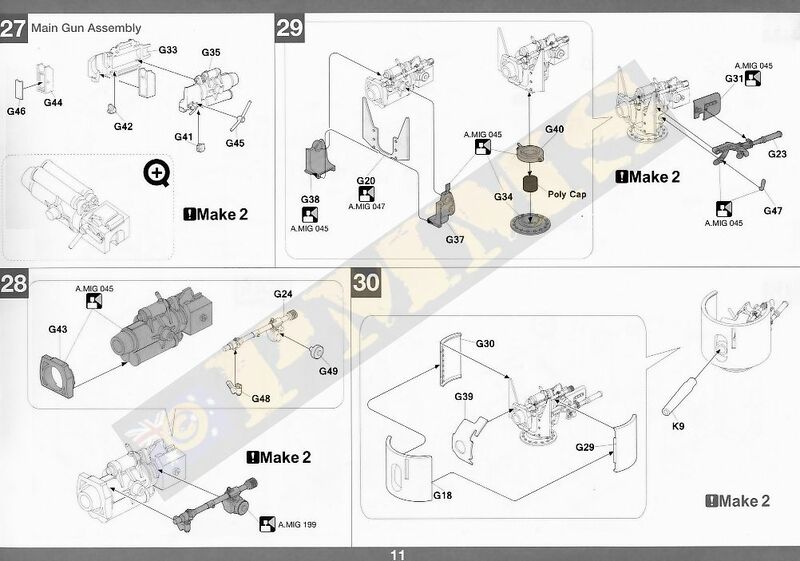 These are in the form of a 16 page booklet with the usual numbered parts in exploded view drawings which are clearly laid out and easy to follow and the previous miss numbered parts have all been correct for this kit. 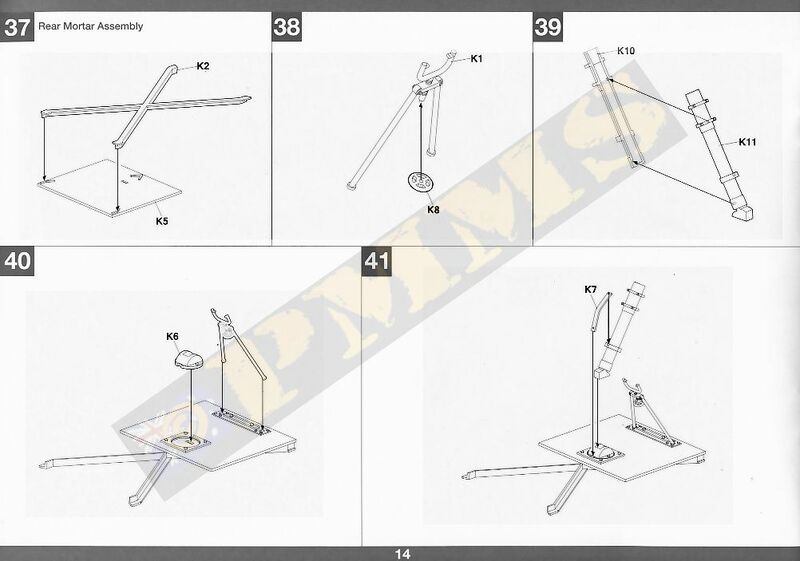 As with any instructions you should carefully study the sequences before any cutting or gluing to avoid any problems but the clear steps aided in making assembly quite straightforward overall. 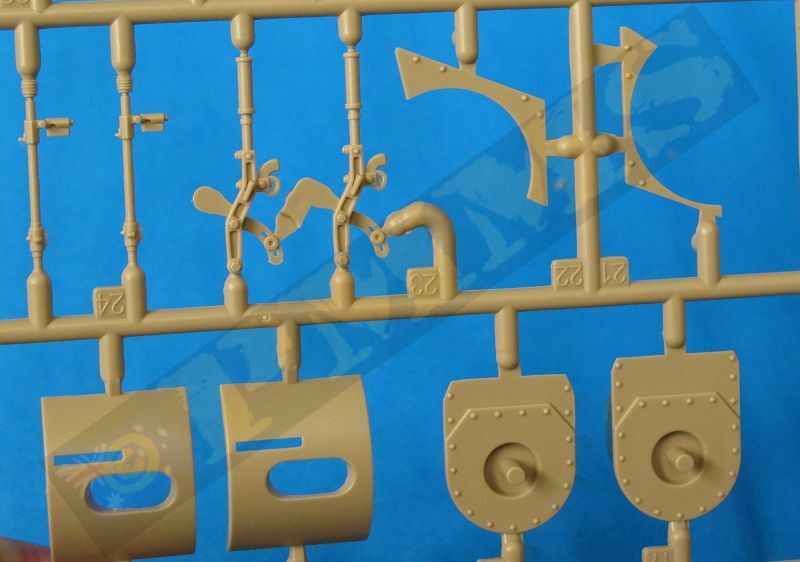 There are no decals provided with the kit as all the pilot test Tadpoles were simply painted over all “neutral brown” in colour with no additional marking shown on available period photos. There is also a small colour painting guide with five view illustrations of the Tadpole included with only Mig paint numbers being shown. 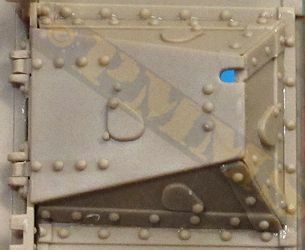 The overall colour is shown as “green moss” but as mentioned references indicate the most likely colour would have been the standard “neutral brown” but I am not sure the actual paint references for this colour. 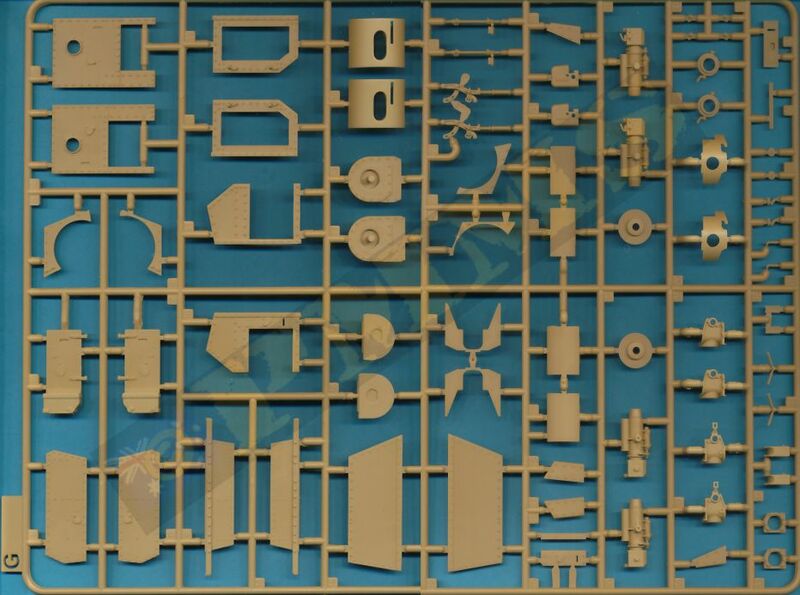 As with the first Mk.IV kits from Takom this kit is dimensionally accurate featuring good quality mouldings with clean crisp details overall with just a few instances where the detail definition could be improved, there is few if any pin marks to contend with and minimal clean-up other than the mould seam lines on most parts. 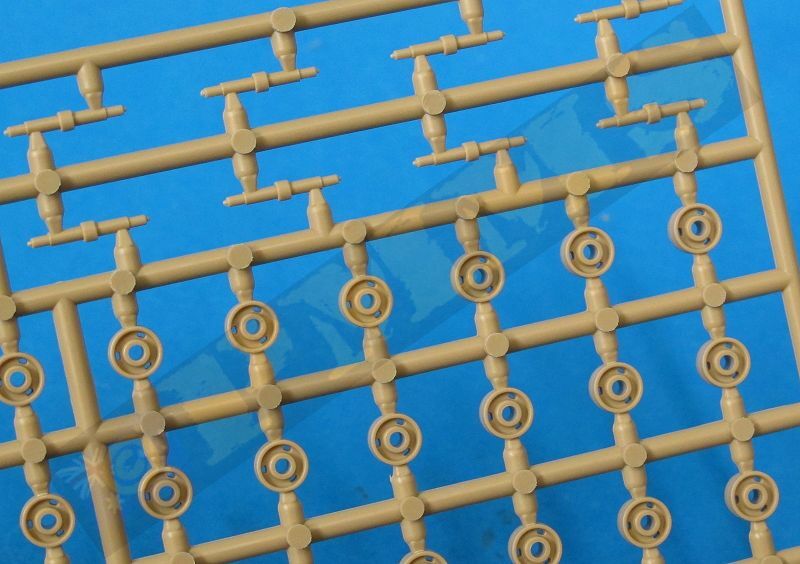 The new simply clip together set of Mk.IV tracks makes life a lot easier while still giving an excellent appearance on the finished kit. 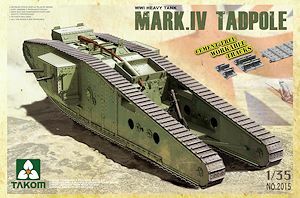 Overall this is a very good kit of the British Mk.IV Tadpole with pros outweighing the cons even if it did not enter production it should still make a nice addition to the WWI tank ranks.